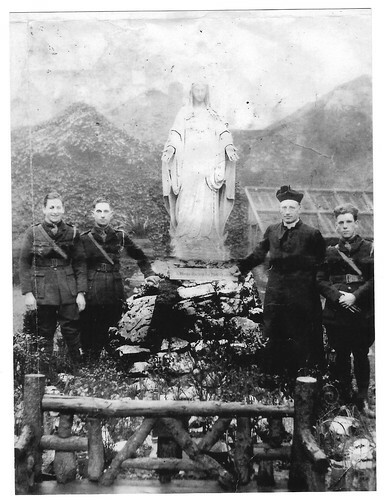 A friend of my dad is trying to put a rough date on the attached photo of his grandfather - Laurence McKenna, the one standing beside the priest. He was originally from Belfast but joined the National Army / Defence Forces at some point. To my amateur eye, the uniform looks more like that of the Irish Volunteers - Civil War era National Army tunics had a vertical collar whereas the three soldiers in the pic are wearing shirts and ties. The inscription on the base of the statue is in Irish which makes me think the photo was more likely taken in the Free State. the skyline suggests the Kerry Reeks, but I'm afraid I can offer no better help. Hope someone else can. I guess that type of uniform was during the time of Hitler. "Some guys are the type of people who bring brass knuckle company to a fight. I've always thought it prudent to bring some running shoes."